Recreational Vehicle Entry Doors or RV entry doors are one of the most heavily used components of any recreational vehicle. It is important to choose the right kind of RV entry door. 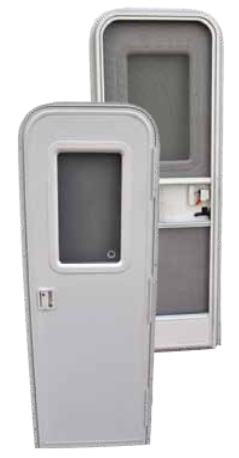 Do you need a travel Trailer entry door or do you need a motorhome or class A entry door. The construction and the requirements are quite different. Click on the appropriate door for your application, and login to get an instant online quote custom made to your exact specifications. If you would like an option that we don't offer, please give us a call and we will do our best to accommodate you.